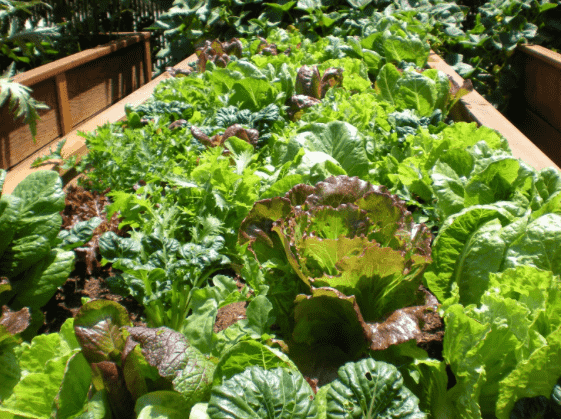 Homestead Garden > Vegetable Growing > Why Should You Grow Your Own Vegetables? I wanted to put this post out there to make a statement, a personal view on why should you grow your own vegetables, and how doing so can be so impactful on our own lives, the lives of those around us, and indeed, on society as a whole. I also hope to instigate a discussion, contrary viewpoints, experiences, and strategies to improve our abilities to take control of our lives, our health, and our nutrition now, and into the future. 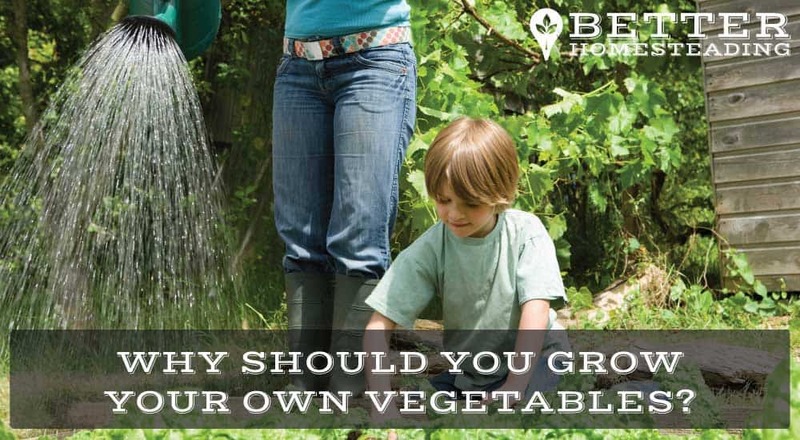 There are many tangible benefits of growing your own garden, full of vegetables and fruit. With modern foods losing much of their nutritional value due to inappropriate harvesting (picked too early), inappropriate transportation (food travelling worldwide to its final destination), food spending too long on supermarket shelves, massive wastage at commercial and consumer level, one would not be far off the mark in assuming that our current food production and consumption system is in a mess. To this end, and with the apparent (fairly obvious?) disconnection between ourselves in the ‘modern’ world, and our food, I believe that there is a strong case to be made for localised food production getting the attention it deserves, and for more health conscious, and food aware consumers (we are all consumers when it comes to food after all), to start taking steps, however small, to begin to provide food for ourselves and our families. There are certainly good examples of villages, towns, and even large cities, embracing food production, for eating, for sharing, for forging community conversation and connections. And let us not overlook education. Sharing one’s experiences, both good and bad, with someone else, is a fundamentally human endeavor, experience being passed down through generations, that all but seems to have become a distant memory, a tradition lost that has left us far worse off. But, the pleasure and satisfaction that comes from bringing in a bowl of vine-ripened tomatoes, a fresh (and sometimes not perfectly formed) cucumber, fresh herbs, salad leaves, kale, cabbage, broccoli, (add vegetables of your choice), is a feeling that surely must be intrinsic to us as human beings. It certainly feels that way to me. What about you? What about watching your kids rummaging around in the garden in search of fresh strawberries, or nibbling sweet fresh peas from the pod? That is enough to put a smile on any parents face. In 2005 I moved to Australia, where the weather (in the summer at least), was good for vegetable and fruit growing. Up at over 1000m above sea level on the Northern Tablelands saw winter temperatures regularly dropping well below -6 deg C at night, often down to -12 deg C, which stopped pretty much anything growing. This brought the growing season down to around 5-6 months of the year. Back here in the UK, the growing season is still not long, but the lack of temperature extremes, and the somewhat better rainfall (good for the garden, irritating if you want to get out and about), makes for a pretty comfortable climate to grow some food. Feeling closer, more connected with the earth, the seasons, and my locality. Self reliance – the feeling that I have control over my food sources and am not reliant on externalities (shops, transport, government). Fresh, unspoiled, perfectly ripened food at your fingertips. The joy of food exchange, sharing with others in your community. Totally organic – I choose what I put on, and in my soil. 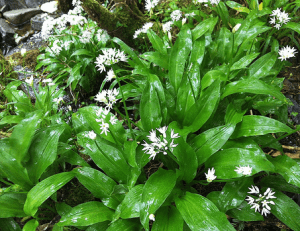 Creating bio-diversity – bringing a wider range of creatures into my garden. Grow what you like to prepare and eat. Enough said – grow what you and your family enjoy. Reducing food transport miles. Food miles are zero when it comes out of your back yard. Teaching food production to future generations – a great legacy to leave? There are potentially hundreds more great benefits and few drawbacks to growing your own fruit and vegetables. A little preparation, a little time to tend your crop. 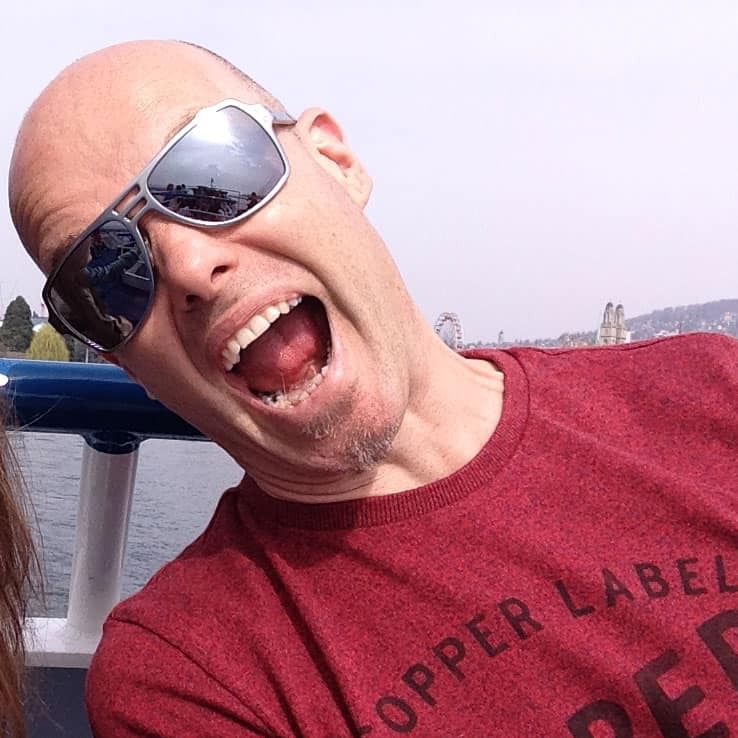 If you think outside the box a little, there are many ways to reduce the need for input. Mulching, watering systems etc, all save time for little cost. I find it really hard to find any real disadvantages of growing your own food. There is a time component, some skills to acquire, but the rewards massively outweigh any disadvantages. I see no drawbacks that can’t be rationalized away when the benefits are considered. This sounds simple, but it is pretty important. I’ve done it, most people do it, and it’s often not worth it 🙂 Trying to grow lemons year round in a climate that just does not support it is going to waste a lot of time and energy, and the failures tend to put a damper on your motivation. Well, it does for me, but perhaps I’m just a grumpy old sod? I definitely believe that food variety is a good thing, probably for health, but likely more from the perspective of enjoyment, interest, and the ability to try out many different recipes. I love kales, but if you only grow kale, you might get bored of kale? So, if you want a very productive vegetable garden, with food to eat for as much as the year as possible, it is definitely worth doing some research into what grows well in your climate, but also, what grows well in similar climates in other parts of the world. I’ve spent some time (particularly when living in chilly Armidale, Australia) looking for vegetable varieties that could extend my growing season or plants that were well suited for preserving, either fermented, pickled, dried etc. There are actually a wide variety of ‘cold climate’ plants that worked well, certain kales would grow for longer, and at least survive the winters, springing back into life as the Spring brought some welcome warmth. It can be a problem getting seeds into your own country from overseas, just check with your country’s import restrictions to see what might or might not be allowed. The UK was a really good source of seeds, most of them were fine to import to Australia. I ordered Ransomes (wild garlic), Siberian Kale, Giant Broccoli, and a plethora of other seeds. It’s really exciting to get new sees arriving in the post and planting them, waiting to see what comes up. One idea that is becoming more and more popular these days is growing vegetables indoors. Does a lot to fix the climate issue, you just need to manage light and moisture well. Definitely worth considering. There are a wealth of resources online that can help you find vegetables and fruit, from other parts of the world, that can work well in your garden, and even extend your growing season beyond the norms of your ‘indigenous’ or ‘traditional’ vegetable species. Here are a couple of useful sites for those who live in a cold or temperate climate. Both these, and most other vegetable gardening methods take a little initial setup, but once developed, maintenance can be kept to a minimum. What I love about the bio-intensive method is its ability to produce a complete, virtually ‘closed’ system. A closed system is one where all the inputs and outputs are produced on site, without the need to bring in external materials. We obviously need to buy in seeds or seedlings, but further down the line, you can definitely collect your own seeds from your most productive plants (providing you plant non-hybrid varieties). The bio-intensive method provides composting know-how, digging methods, plant spacings for optimum yields, and so much more. If you are interested, here are a few book links to whet your appetite. Here is the first in a 9 part video series by John Jeavons on the bio-intensive system. The rest of the videos are available on the youtube channel here. These videos should provide all the information you need to get started, the books offer excellent plat lists and bed layouts, as well as planning quantities and times to maximise food yields. The bio-intensive gardening method is super productive, as this bed picture shows. 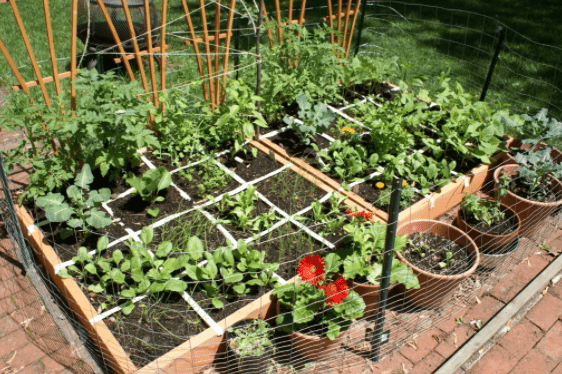 As mentioned, I have not practiced this gardening method, but I’m including it because I believe that its principles are ideally suited for those with restricted spaces to turn over to food production. Many of us live in the city, in apartments, or in homes with shared garden spaces. There definitely is a way to grow a lot of food in these types of homes, this square foot layout shows what is possible. This example shows a variety of plants under cultivation, it is definitely possible to enjoy a good variety of vegetables in your diet with limited space. If this appeals to you, Mel Bartholemew has written a number of books on the subject, this one, available on Amazon can be bought in a variety of formats. All New Square Foot Gardening – Paperback Or Kindle Versions. I am convinced that growing our own food is, and should be a central tenet of a healthy and active lifestyle. If you have the funds to buy all your food in, good for you. 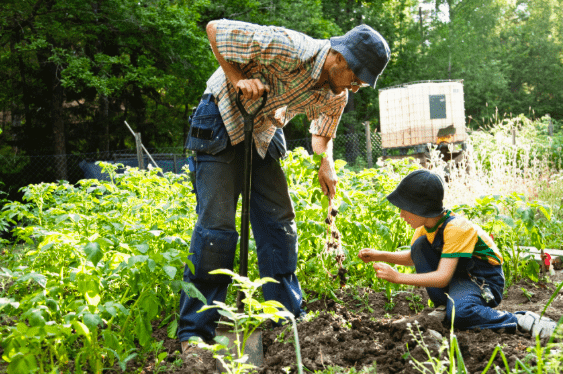 But even the richest of people would do well investing some of their wealth in a home food garden, and you could also bring some extra employment to your area in the process. I really hope this post has provided some ‘food for thought’ and might give you a little nudge to investigate growing, at least a little of your own food, and provided some good reasons as to why you should grow your own vegetables. It is a beautiful thing to nurture food to feed your family. But even if you live alone, in an apartment on the 20th floor, there are still many ways to join the millions of home food producers from around the world. So, get growing, enjoy eating, and a little of your daily movement needs will be built into the process for FREE.